← Are China and Brazil transforming African agriculture? 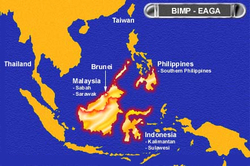 The agribusiness cluster of the Brunei Darussalam-Indonesia-Malaysia-Philippines East Asean Growth Area (BIMP-Eaga) is targeting a total of 100,000 hectares for expansion of hybrid rice production area in the sub-economic region. THE country’s agribusiness cluster of the Brunei Darussalam-Indonesia-Malaysia-Philippines East Asean Growth Area (BIMP-Eaga) is targeting a total of 100,000 hectares for expansion of hybrid rice production area in the sub-economic region. This will be undertaken by the SL Agritech Corporation (SLAC), a subsidiary of Sterling Paper Group of Companies. The target was being discussed and highlighted by the BIMP-Eaga Agribusiness cluster during the recently-concluded Strategic Planning Meeting (SPM) 2016 hosted by Davao City last month. “The SL Agritech is currently in the process of exploring available and potential areas for expansion of the hybrid rice production especially in Mindanao,” Romeo Montenegro, director for investment promotions and public affairs of Mindanao Development Authority (Minda) and the Philippines National Secretariat Alternate head said.